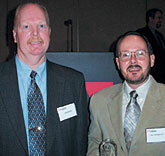 The IRS' John R. Wood, left, and Paul A. Showalter accept their awards. Adobe Systems Inc. inaugurated its Innovators in eGovernment award program last month at FOSE 2002 in Washington by honoring two IRS employees, Paul A. Showalter and John R. Wood. Showalter, a senior technical publishing specialist, has been instrumental in the agency's effort to provide electronic tax forms on the IRS Web site. More than 2,000 forms and informational documents are available online. He also oversaw a project to improve IRS compliance operations and was responsible for creating electronic versions of the tax materials necessary for conducting examinations, which now are available to IRS examiners on the agency's extranet. Wood, also a senior technical publishing specialist, is responsible for the development of the Tax Products CD-ROM, which provides more than 3,200 IRS forms and assistive materials. The IRS distributes more than 1 million of the CDs a year, available for free in public libraries. Besides the awards, Adobe donated $2,500 in the name of each recipient to the Food and Agriculture Organization of the United Nations, a nonprofit group that has worked since 1945 to alleviate worldwide poverty and hunger.